How? By drawing customers through their front door for more than one reason, such as a craft beer or wine bar, or a selection of premium coffee and espresso, on top of a great selection of titles. Giving customers two reasons for coming to their business means these entrepreneurs have doubled their chances at finding new customers. You can use subdomains to do the same for your business online, building two unique traffic funnels on the same website. Learn more about subdomains below to figure out how they can help both your website design and marketing strategy at the same time, growing your business twice as fast. Subdomains allow you to create different websites alongside your primary website with each contributing traffic to your overall metrics. These websites could be anything from an ecommerce store, a blog, different landing pages for special new products or projects, and so much more. When you’re shopping online and land on a company’s website, the domain in the address bar, for example, brand.com, is the primary domain. Then, when you click the ‘Shop’ tab on their website, or head to their blog, you may likely end up on a subdomain, such as shop.brand.com, or blog.brand.com. The power of subdomains is two-fold: search engines recognize subdomains as a separate domain, and they allow you to create backlinks back to your primary domain. This means you your website’s search ranking will increase in two different ways, increasing traffic to your website. If your business is targeting two different keywords that relate to two different target audiences, your primary domain can start ranking for both by creating two subdomains, each one targeting a different customer base. Since both subdomains point back to your primary domain name, your website will start ranking higher in search results for both keywords, but the specific subdomains will help keep your focus on targeting traffic for one audience at a time. Like the businesses creating two different revenue streams, one for books and another for wine, creating multiple platforms using subdomains lets you expand your business’ online revenue streams. If you have two different categories of products, you could create a different subdomain for each. This allows you to target two different audiences looking for different products, but establish yourself as an authority for both. If you’re running a landscaping business that also offers a property management service, one subdomain, could attract your customers looking to maintain their home while they’re away, while the other can focus on landscaping projects. Though there is some customer overlap, you can target these different customers more effectively if you separate them. Since each subdomain will be more sharply focused on each customer segment, each can become more effective at conversion. While subdomains can be an effective tool for your website design or marketing strategies, they’re not the only one available. Subdirectories work in nearly the same way, but have a different look, so while some SEO experts say subdomains lead to better search ranking, there is still much debate. The choice is ultimately up to you and your needs. For example, Domain.com is using a subdirectory for its small business marketing services page, using domain.com/full-service as the URL. If you wanted to keep your domain name front and center to focus on your brand, then your landscaping business could use the URL landscape.com/blog, instead of blog.landscape.com to tell customers about your latest news. Starting a new business brings risk, so why use only one angle to draw customers through your front door? 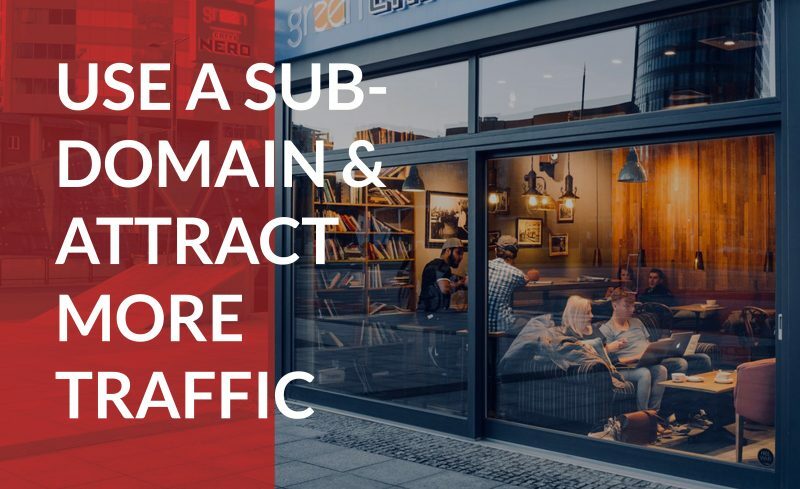 Like those crazy entrepreneurs starting brick and mortar bookstores with a bar attached, you can use subdomains on your website to create two chances for drawing in new potential customers. With more customers coming to your business, you set yourself up to potentially start to doubling your revenue.